An innovative proposal for a prefabricated shopping centre – designed to be “screwed not glued” together and reassembled elsewhere – won the top prize at last night’s International Brickworks Living Building Challenge design competition at the Melbourne School of Design. The winning submission was a collaborative effort between dwp|suters, Aurecon, CJ Arms, Reedbed Technology, Eco Harvest, Biomimicry Australia, Future Food and Watpac. 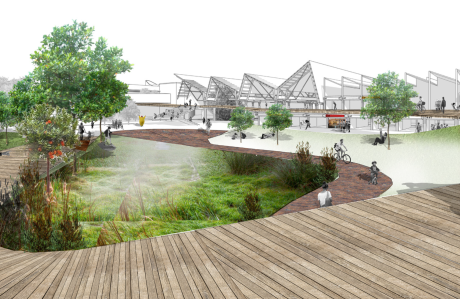 “Among the strong calibre of entries, The Difference is Living is a worthy winner given the design’s strong alignment with the principles of the Living Building Challenge,” said Living Future Institute of Australia (LFIA) vice chair Stephen Choi. The Difference is Living places the connection between humans and the natural world at the fore, through its ‘Bush Tucker’ green walls. The design features approximately 3900 square metres of billabong plants, including over 2000 square metres of vine growing structures along the perimeter of the site. The competition was coordinated by the LFIA, the local arm of the International Living Future Institute. Frasers Property Australia was the principal partner, with Brickworks’ shopping centre site in Melbourne the subject of the competition.